Three decades after it banned Monty Python’s Life of Brian, the Welsh town of Aberystwyth was finally reconciled with ‘blasphemers’ Michael Palin and Terry Jones as they attended a special showing of the film. The historic event at Aberystwyth Arts Centre was organised by Sue Jones-Davies, the town’s mayor, who played Brian’s girlfriend Judith Iscariot in the film. In contrast to the reaction in 1979, when the town banned the film, a sell-out crowd turned up to see the two Pythons and the film that outraged many Christians. Jones, who said he was a frequent visitor to the town as he owns a cottage around 30 miles away, said: “This is the first time publicly that Life of Brian has been shown so we thought we had to celebrate that wonderful fact. Jones said the film was never about mocking religious belief. Palin said he had been attracted by “the fact that the mayor of this fun city is in the film in all manner of wonderful costumes”. “The part she played was a political firebrand and she is the only one in the Python team that went into politics,” he said. 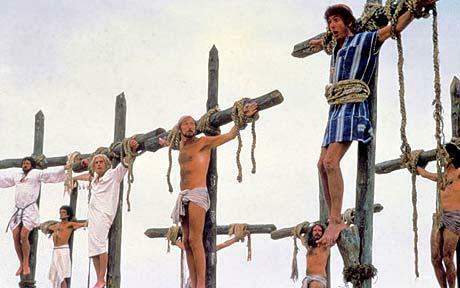 Palin later said he was quite worried about the “unbanning” of The Life of Brian in Aberystwyth as the restrictions on its screenings over the years had only made it more popular as people clamoured to see what the fuss was over. Proceeds from the evening will be split between the British Heart Foundation, nominated by Ms Jones-Davies’ and Truthout, the news agency dedicated to establishing a powerful, stable voice for independent journalism, which was nominated by Jones. Go here for our earlier post on this – from August 2008. “We’re all unique! We’re all individuals!” Still cracks me up. “He’s not the messiah! He’s a naughty, naughty boy!” still cracks Patty and me up. It said in aberystywth’s local paper week before last thats it turns out that this film wasnt even banned 30years ago as they first thought ! !